Verdi’s first version of Simon Boccanegra was written for a commission from the Teatro la Fenice in Venice for the 1856-57 season. The subject was ideal for Verdi, involving both parent-child relationship and revolutionary politics. The political aspect caused the local censor to give composer and Piave, his librettist, a hard time despite the action being set in 14th century Genoa. The gloomy subject-matter allied to Piave’s rather rambling libretto, including a twenty-year gap between the prologue and the resumption of the plot, did not help audiences. At its premiere on 12 March 1857 Verdi’s 21st opera was, in his own words, a greater fiasco than La Traviata. The critics of the time wrote about the lack of easily remembered arias and melodies. A production at Naples went better but that at La Scala in 1859 was a bigger fiasco than Venice. The composer had moved his musical idiom much too far for his audiences and he wrote: The music of Boccanegra is of a kind that does not make its effect immediately. It is very elaborate, written with the most exquisite craftsmanship and needs to be studied in all its details. Verdi’s regard for his composition, and he was his own sternest critic, meant that although the work fell into neglect, the possibility of revision and revival was never far from his mind. In 1879 he had written nothing substantial since his Requiem in 1874 and no opera since Aida ten years earlier. His publisher, Ricordi, raised the subject of a re-write of Boccanegra. Although in private he was seriously considering Boito’s proposals for an opera based on Shakespeare’s Otello, in public he gave the impression that he had hung up his pen. When Ricordi told Verdi that Boito, who was providing him with synopses and other suggestions for Otello, would himself revise Piave’s libretto, the composer agreed to undertake the task. The Otello project, a close secret and code-named ‘chocolate’, was put on hold but not forgotten The revised Simon Boccanegra was a triumph at La Scala on 24 March 1881 and it is in this later form that we know the opera today. This is the version which is featured on this recording. The story of Simon Boccanegra concerns the political conflict between the Patricians of Genoa lead by Fiesco and the Plebeian faction. Fiesco’s daughter Maria has loved the eponymous corsair and borne him a daughter. Simon wishes to make peace with Fiesco and marry Maria. Paolo Albiani and Pietro, members of the Plebeian faction, propose to nominate Simon for Doge, but he refuses until persuaded with the thought that, if he were Doge, Fiesco would be unable to thwart him. But it is too late as Maria has died and her daughter, in Simon’s care, has disappeared. Later the missing daughter is discovered as the unknowing ward of the incognito Fiesco. Simon discovers the fact after promising her hand to Paolo as reward for helping him to power. His reversal of that decision sets the scene for her later abduction. Simon, as Doge tries to placate the differences between the parties in the new scene that Boito added to act 1. This added scene takes place in the Council Chamber and is one of the mature Verdi’s most dramatic musical creations. Its music is clearly a near relative of that in Otello. Its drama contrasts sharply with the first scene with its quiet E major chords that are so evocative of the sea and flowing tides and that which precedes Amelia’s Come in quest’ora bruna. They reflect Verdi’s intimate knowledge of a town where he and his wife spent most winters and owned an apartment. As well as the addition of the Council Chamber scene there are many other differences between the 1880 revision and the 1857 original that make comparisons captivating for Verdi enthusiasts. An audio recording of the original version of 1857 is available from Opera Rara. Directing opera does not appear on Peter Stein’s CV very frequently, mores the pity as he always seems to be able to get to the crux of the work in question. I well remember the coup that Welsh National Opera achieved in drawing him to Cardiff to direct Verdi’s great final masterpieces, Otello and Falstaff. He is not a producer for the scenic spectacular and is always able to work to a tight budget as far as sets and costumes are concerned. In this respect this production, with sets by Stefan Meyer, first seen at Salzburg and then Florence prior to its arrival at the Vienna State Opera in October 2002, is typical. The prologue (Chs 2-10), opens on a bare stage; later curtains part to reveal a sparse but effective Patrician Palace. Fiesco’s figure is superimposed as Simon approaches its open door. Likewise, act 1 opens with a plain horizon as the music (Ch 9), so evocative of the sea, introduces Amelia and her aria Comme in quest’ora bruna (Ch 10). This sparseness, and that of the final acts, contrasts sharply with the more extensive sets for the Council Chamber Scene (Chs 19-23) with the Doge sitting on the Ducal throne above and centre to the two factions, patricians and plebeians. This scene is that which Boito added for Verdi’s revision of the opera and is one of the great challenges for a Verdi baritone. It is vocally and histrionically on a par with that presented to the singer of the role of Rigoletto. At various times I have expressed doubt about Thomas Hampson as a true Verdi baritone. His Di Luna impressed me but I found his Germont in Willy Decker’s 2005 Salzburg production of La Traviata unbelievably wooden in both his singing and acting. In this production he is unrecognisable with acting of sincerity allied to Verdi singing of the highest order. If he lacks that last bit of Italianata of Cappuccilli in Abbado’s memorable audio recording (DG) then his American birth is responsible. Of the current native Italian Verdi baritones I can think of no one who could match Hampson’s vivid and totally committed interpretation here. In the filming of the Council Chamber scene there are one or two superimposed pictures to show the stage activity with a lot of close-ups as well. These come to the fore in terms of dramatic impact as they focus on Hampson’s Doge as he descends the steps from his throne and circles the increasingly shifty-looking Paolo Albiani of Boaz Daniel whose facial expression of fear is outstanding. But it is Hampson’s characterisation and interpretation throughout the several facets of the Doge’s responses during this scene that have prior claim on your praise. So to his singing and acting in acts 2 and 3 as he forgives Gabriele Adorno, strongly but not sensitively sung by Miroslav Dvorsky. Peter Stein’s directorial influence draws out excellent acting from Cristina Gallardo-Domas as Amelia Grimaldi and Ferruccio Furlanetto as Fiesco. She is no bland wimp; she breathes feistiness and one can well believe her statement that she had made Lorendano fearful of holding her captive and thus allowing her to escape to the Ducal Palace and the protection of her father. There is a price to pay in the odd moment of impure tone but otherwise hers is a very believable interpretation and as valid as Kiri Te Kanawa’s on the otherwise undistinguished audio version conducted by Solti or Nuccia Focile’s very lyric interpretation on the live recording from the 2000 New Zealand festival production. Ferruccio Furlanetto is one of the finest of native Italian Verdi basso cantante voices currently before the public. Although looking rather too old in the prologue his singing of the showpiece Il lacerato spirito (Ch 5) is sonorous and secure although he has to reach for his lowest notes. His appearance in the later acts, set over twenty years later, is more appropriate whilst his acting is even more convincing and full of pathos as Fiesco is finally reconciled with Simon (Ch 37). Peter Stein draws out very fine acting from this cast with his view of the opera clearly focused on the human relationships and interactions of the story rather than the political perspective. For a grander approach on DVD, Gian Carlo Del Monaco’s opulent Met production conducted by Levine with Te Kanawa as Amelia, Domingo an ardent Gabriele and Chernov an impressive Boccanegra is a complement rather than a rival. I do not know if any video recording of Strehler’s 1976 La Scala production exists, and it was widely performed including at London’s Covent Garden, but a more recent Abbado performance is available on DVD. 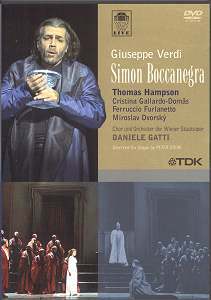 Otherwise Hampson’s portrayal of Boccanegra is one of his finest and will not disappoint. Another virtue is the absence of raucous applause and regular curtain calls at the end of acts; so often present on Vienna live audio and video recordings. Here, each act moves to the next without interruption.